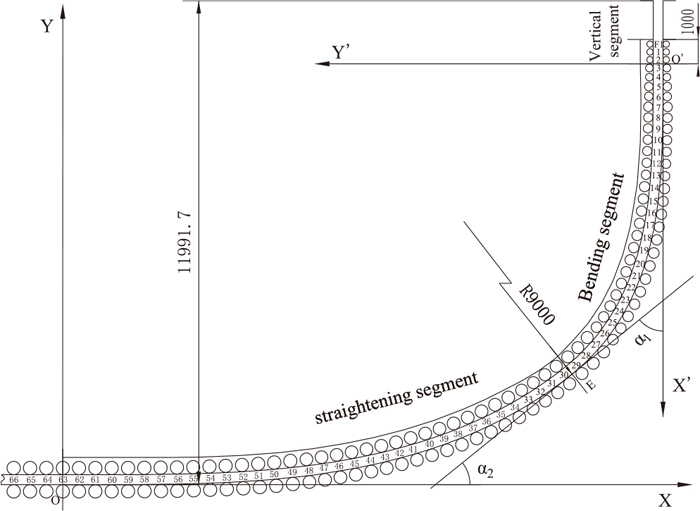 A new creep straightening casting curve that continuous casting slab can be straightened by full using of high-temperature creep property was proposed in this paper. The basic arc segment is cancelled in the new curve so that length of the straightening area can be extended and time of creep behavior can be increased significantly. In order to maximize the use of high-temperature creep property, various curvilinear equations with different changing rate of curvature were studied. The distance from solidifying front of slab at 1200°C is confirmed by finite element method. The strain rate at different locations which is beneath the center of inner arc surface were calculated when temperature is 1200°C. Uniaxial tensile tests of Q345C were carried out in order to obtain yield strength and minimum creep strain rate. It is concluded that the strain rate in the straightening area of new curve was less than minimum creep strain rate under yield strength at 1200°C. Therefore, strain rate can be below minimum creep strain rate on new creep straightening curve so that deformation of slabs depended on creep behavior only comes true. Continuous casting slab is straightened by means of creep strain so as to reduce the straightening strain and strain rate substantially. Internal cracks of slab caused by straightening could be effectively avoided, and the quality of the slab could be improved.